Glaucoma is a very common eye condition and one of the leading causes of preventable blindness in the UK. By being aware of it, we can detect it early on and therefore reduce its impact. Your eye has pressure just like your blood and when this Intra-ocular Pressure (IOP) increases to dangerous levels; it damages the nerve at the back of the eye, the optic nerve. This can result in decreased peripheral vision and eventually blindness. 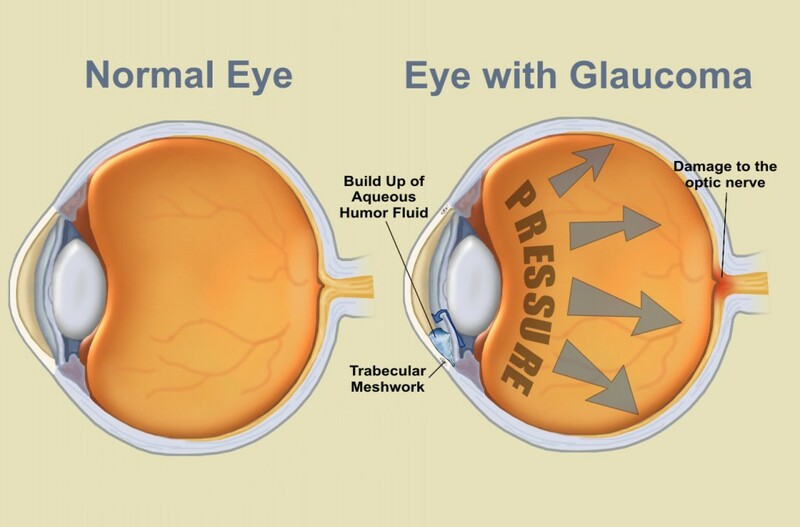 Glaucoma is often called the “silent thief of sight” as there very few warning signs, no hint that anything is wrong. About half of sufferers of glaucoma do not realise they have it. Glaucoma gradually reduces your peripheral vision, but by the time most people become aware of it permanent damage has already occurred. If the pressure inside the eye remains high, the destruction can progress until tunnel vision develops and only objects which are straight ahead are visible. As there are virtually no symptoms in the early stages it is important to have regular eye health checks every two years even if you do not require glasses. A series of completely painless tests can detect the pressure of glaucoma. It is mainly treated by using drops which need to be used every day to reduce eye pressure and then maintain it at a low level. Occasionally laser surgery is required to assist in the lowering of the pressure. It may come as some surprise but diabetes is now the most common cause of blindness amongst the working-age population in Western Europe. There are several ways in which diabetes can affect the eyes, most commonly a temporary blurring of the vision before diagnosis; this tends to be a result of uncontrolled blood sugar level. 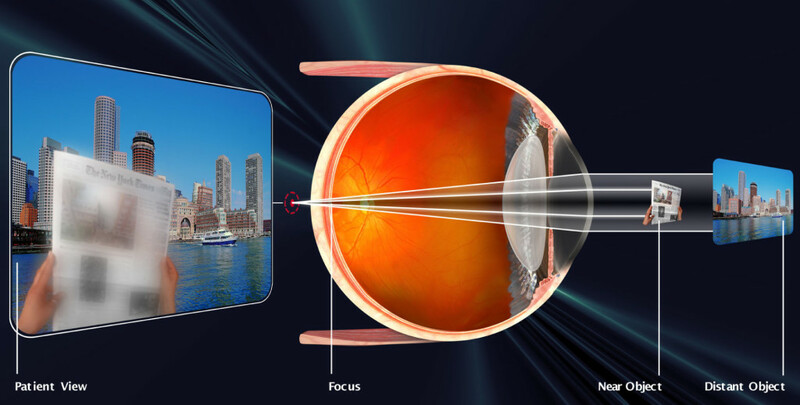 Once the condition has been diagnosed and the appropriate treatment administered, this blurring tends to resolve and vision returns to normal. This short-term change in vision can also be a good indicator to diabetics that their blood sugar is not being properly controlled. However, diabetes can remain without visual symptoms for a long time and in these cases unseen damage can occur due to leaking blood vessels both in the eyes and elsewhere in the body. 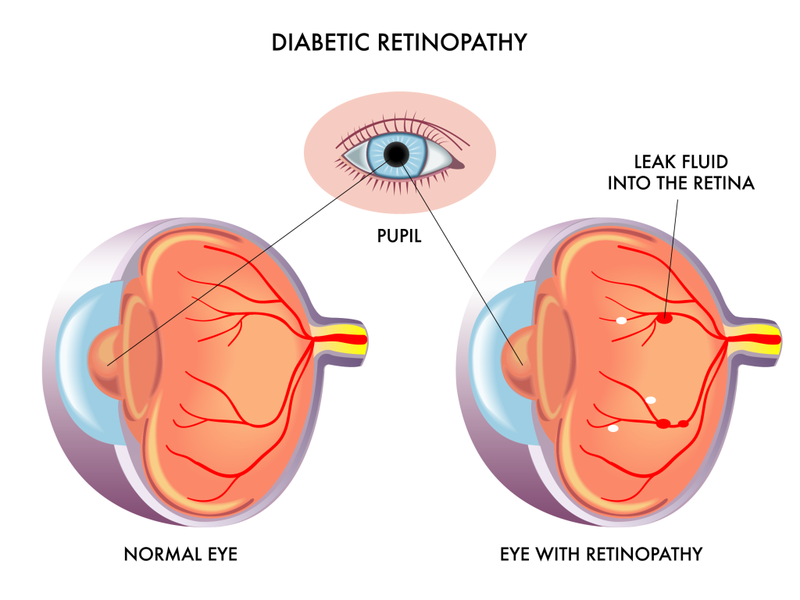 Should such damage occur in the eyes it is termed diabetic retinopathy – this is damage to the light sensitive layer at the back of the eye (the retina). The problems occur when the fine blood vessels in the retina start to leak and disrupt the blood supply around the retina. To prevent this loss of supply, new vessels are formed but these vessels tend to be weak and easily damaged causing further leakage and eventually scar tissue formation. As a result the retina of the eye is permanently damaged causing loss of vision. Significant diabetic retinopathy of this nature can be prevented in most cases with careful diet and medicated control. In those cases where damage has already occurred, the new blood vessels can be sealed via laser treatment. This is designed to save the remaining sight but will not improve on what has been lost. It has been estimated that up to 95% of those with significant diabetic retinopathy can avoid substantial visual loss if treated in time. The best way to attempt to avoid diabetic eye disease is to maintain blood sugar levels as advised by your doctor and attend for regular check-ups. It is also recommended that you see your optician at least annually for a dilated eye examination or retinal photograph. This is a progressive condition that can affect people as they get older. The part of the retina responsible for seeing fine detail is called the macula and it is affected in age related macular degeneration. Sometimes the delicate cells of the macula become damaged and stop working. As macular degeneration is an age related process it usually involves both eyes, although they may not be affected at the same time. Dry macular degeneration is the most common form and usually causes gradual changes in vision because the visual cells simply cease to function. Like the colours fading in an old photograph. In wet macular degeneration, vision can drop quickly due to the rupture of small blood vessels beneath the macula resulting in a large scar behind the eye. In the early stages central vision may be blurred or distorted, with things looking an unusual size or shape. Some people notice a black patch or black spot in the centre of their sight. If you suspect that you may have macular degeneration you should see your doctor or optician, who will exam the macula closely with an instrument called an Ophthalmoscope. Another test that may be used is a grid pattern called an Amsler Chart which resembles a piece of graph paper. Patients with macular degeneration often report that sections of the grid appear distorted or missing. For treatment of macular degeneration to be effective it must be diagnosed as early as possible, as damage cannot be reversed. With dry macular degeneration, vitamins and minerals are often prescribed to prevent further progression e.g. I-Caps which contain high amounts of carotene (found in carrots) as well as diet alteration to include a lot of fruit and vegetables. 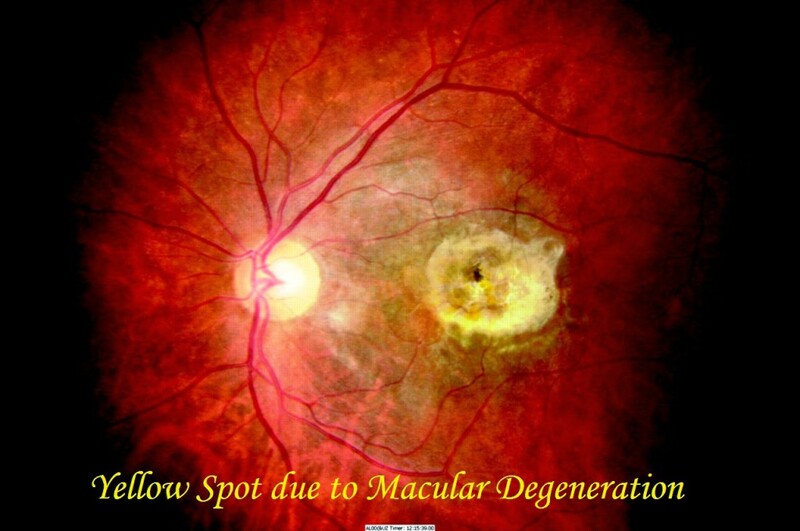 With wet macular degeneration where new blood vessels have appeared laser surgery may be used. In this treatment a focused, intense beam of laser light is used to seal off leaking blood vessels and to prevent new blood vessels growing. •	Improve our diet to include coloured vegetables such as peppers and spinach. •	Reduce alcohol intake and stop smoking. Presbyopia is a visual condition in which the crystalline lens of your eye loses it’s flexibility, which makes it difficult for you to focus on close objects. It may seem to occur suddenly, but the actual loss of flexibility takes place over a number of years. Presbyopia usually becomes noticeable in the early to mid forties and is a natural part of the ageing process of the eye. When people develop presbyopia, they find they need to hold books or newspapers at arms length in order to focus properly. When they perform close work they may develop headaches, eye-strain or feel tired. Spectacles such as reading lenses or varifocals are the most common correction for presbyopia. Reading glasses will correct the near vision blur but will blur the distance vision when you look up. Varifocal glasses correct the close work but when you look up the distance vision is not disturbed and are therefore more versatile. If you wear contact lenses, then reading glasses can be worn while wearing your lenses to focus on close work. Another type of contact lens correction for presbyopia is mono-vision, in which one eye wears a distance prescription and the other wears a prescription for close work. Surgical options to treat presbyopia are also available. One example is conductive keratoplasty which uses radio waves to create more curvature to improve near vision in one eye only, for a type of mono-vision correction. Lasik can also be used to correct presbyopia in which one eye is corrected for near vision, while a new procedure called presbylasik actually moulds the cornea to create vision at multiple distances. Many other surgical options are being researched such as increasing the flexibility of the eye’s hardened lens and the introduction of a replacement lens so that patients undergoing cataract surgery can achieve clear vision at all distances. The minimum requirement for driving vision is to be able to read a number plate at 67ft. It has been shown that 10% of motorists would fail even this most basic of standard because of poor eyesight. If you do require spectacles for driving it is important that you wear them at all times. This may seem obvious but every day thousands of motorists do not wear their spectables for driving because they have forgotten them or they are only driving on familiar roads. If you require spectacles for driving then make sure that on a sunny day that you use prescription sunglasses to maximise your visual performance. It is also essential that the windscreen is not scratched or dirty inside or out. Most of us are awar ethat driving at night is more demanding and it is a fact that the number of night road accidents are much greater than those that occur during the day. There is no evidence to suggest that amber night driving spectacles that you see advertised in the press imrpove vision on the road. Indeed the Highway Code is very specific and warns drivers not to use any form of tint at night. A clear anti-reflection coating is beneficial for oncoming headlights at night time as will looking at the left on oncoming traffic. Unfortunately a variety of changes in the eye can contribute to discomfort from glare particualarly among older drivers. This is commonly caused by early cataracts so have your driving vision checked regularly. Your car lights are important so make sure that the headlamps are clean and that your lights are properly adjusted to provide good road illumination. 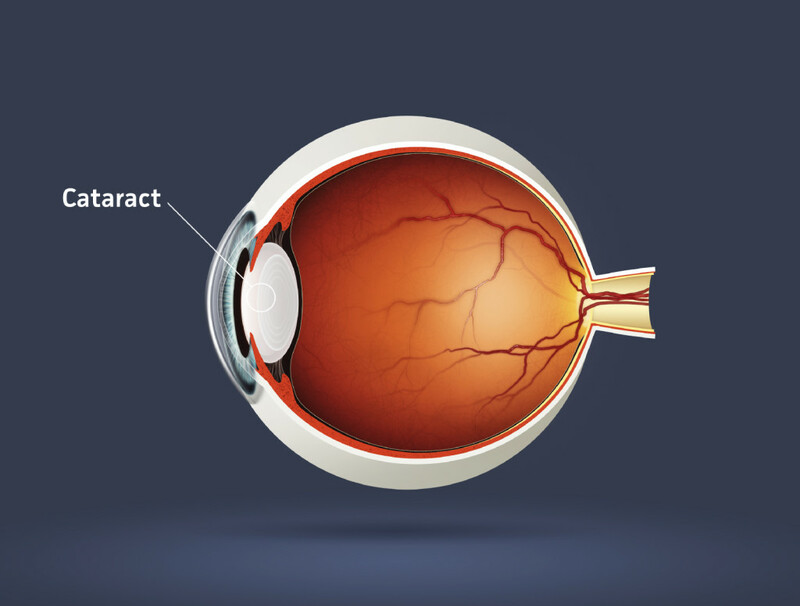 A Cataract is a clouding of the lens; the transparent, flexible section if the eye located behind the iris and responsible for our ability to focus on objects at different distances. As a person gets older, the lens begins to lose flexibility and clarity. For some patients, a mild clouding of the lens with no symptoms can go untreated for years with little problem and is not termed a cataract until it actually interferes with their vision. 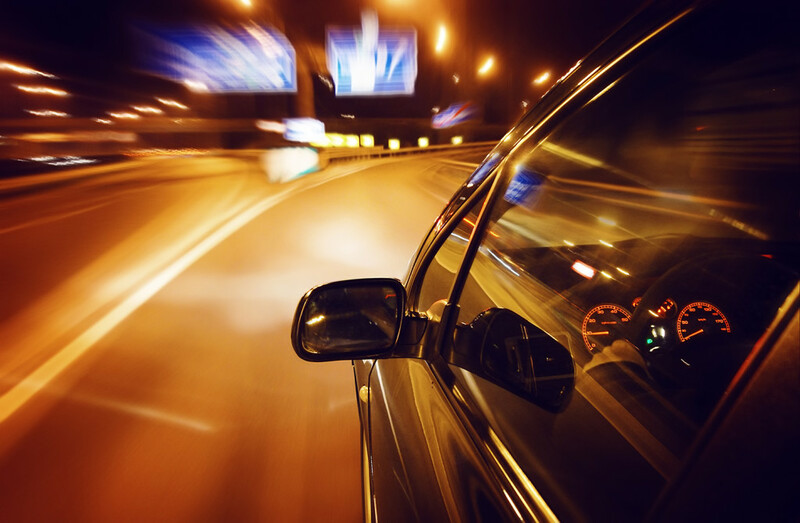 One of the earliest symptoms tends to be an increase in glare when driving at night or trouble seeing small details on screens, books or on television, but it may take several years to reach this stage. Almost half the population over the age of 65 years old will have started to develop a cataract in one or both eyes and by 80 years old more than 4 in every 5 people will have cataracts or have had them removed. These statistics vary with diabetic patients who tend to develop cataracts younger while certain medical treatments and injuries can also cause early cataract formation. Although not common, some babies are born with Congenital Cataracts and if not diagnosed can affect the development of the eye, occasionally causing blindness. For most people, the though of having a cataract is one to dread, sparking thoughts of blindness and complicated surgery and recovery. Thankfully this is no longer the case. With modern keyhole procedures and techniques, many patients will be on the operating table for as little as 20 mins and will not even be required to spend a night in hospital. Once a cataract has been removed, most patients tend to see not only an improvement in their general sight but also in their colour vision. This is because the first stage of a cataract is the yellowing of the normally clear lens, this then takes on a blue brown hue as the cataract forms. As a fully mature, or ripe cataract, is usually white in colour but this stage of a cataract is seldom seen nowadays. Q: Is it true that wearing my glasses all the time will make my eyes lazy and I will become dependent on them? A: No. When people wear the correct lenses they realise they can see more clearly and comfortably. What they may have considered normal and acceptable before is now inferior in comparison. 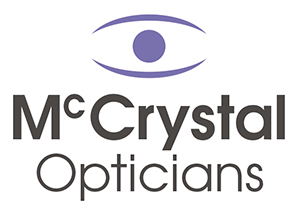 Q: Is an optician the same as an optometrist? A: The term ‘optometrist’ came into use in 1987 to replace ‘ophthalmic optician’ in the same way as ‘pharmacist’ replaced ‘chemist’. An optician can be ophthalmic, dispensing or manufacturing. It is the optometrist who is qualified to test your eyes. Q: Are paper tissues suitable for cleaning my glasses? A: If you have plastic lenses in your glasses then dry tissues will scratch them. It is best to use a damp tissue or use soapy water and a soft cloth. Lenses with anti-glare coatings should be cleaned with a special cloth and spray. Q: At what age does a child have their first eye examination? A: Any age really. A child’s eyes finish developing by around the age of eight years old. Many health authorities screen children in their area at around three years of age, but if you are concerned or if members of your family have eye problems, then it’s best to have your child’s eyes tested early. Q: I am diabetic. Does that affect my eyes? A: Yes. Diabetes can cause several problems with your sight. It is really important that your eyes are thoroughly checked every year, preferably with drops to dilate the pupil so that the retina (back of the eye) can be examined. 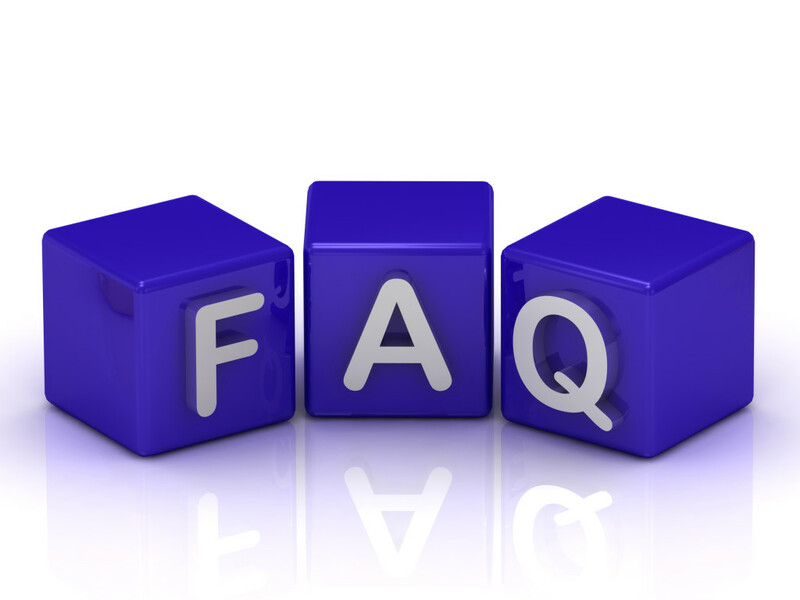 Q: If there is a history of glaucoma in my family, am I likely to inherit it? A: You are more at risk of developing glaucoma if a close relative has it. Glaucoma can be treated effectively if it is diagnosed in time so regular eye examinations are essential. Q: How long does a sight test take? A: It depends on the patient. A young, healthy person with no eye problems should take around 20 minutes. Someone older, with diabetes, glaucoma, high blood pressure or other medical problems could take much longer. The optometrist will determine which clinical tests are required to provide the correct information for new glasses or contact lenses. If necessary they may refer the patient for a medical opinion.